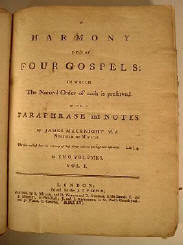 LIST of SUBSCRIBERS NAMES with 'Maybole' appended, to James McKnight's 1756 publication Harmony of the Four Gospels. 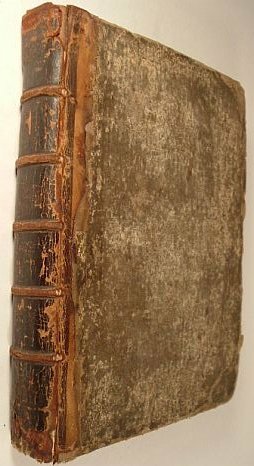 Subscribers names in eighteenth century books give an insight into the lifestyles of the inhabitants of towns of the period, occasionally listing their trades or professions. The cost of this two volume publication was expensive and only wealthy people would have been able to afford a subscription. I have transcribed only the names of residents of Maybole, others in the vicinity, i.e. Kirkbryde, Kirkmichael and the names of various farms I have omitted for reasons of accuracy, in being unable to check that place names are of the area. Subscribers range from London, Dublin, Glasgow, etc. Email me at Cooper Hay if you require a full listing of subscribers. William Butter, Officer of Excise. Right Hon. John Earl of Cassillis. David Doig, Master of the Grammar School. Sir Thomas Kennedy of Culzean. 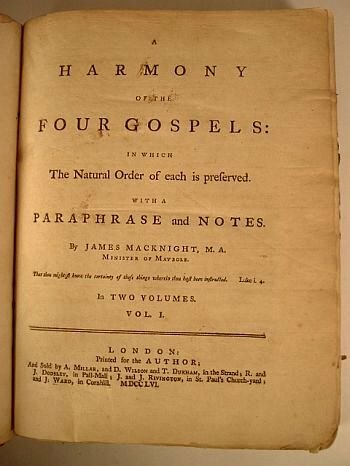 A HARMONY OF THE FOUR GOSPELS: IN WHICH The Natural Order of each is preserved. WITH A PARAPHRASE and NOTES. LONDON: Printed for the AUTHOR. MDCCLVI. A second and amended edition appeared in 1763. Rev. McKnight was the minister at the wedding of Robert Burns' parents in Maybole, 15th of December 1757. In 1759 he was awarded D.D. from Edinburgh University, in 1769 he transferred to Jedburgh, subsequently transferring to Edinburgh in 1773, where he died in 1800.